Thanks to all who attended! Powerpoint presentations from the conference are being posted here. Conference AGM materials as well as the draft strategic plan can be found here. On your own Canadian Museum for Human Rights has a $5 admission on Wednesday evenings, starting at 5pm (admission to the exhibit “Mandela: Struggle for Freedom” is an extra $5”). We suggest meeting at 5pm at the hotel entrance for those wishing to go together. Suggestion to have a meet-up at The Common, The Forks 6pm to 9pm (closes at 9pm). The Forks is a lovely, central meeting space, and The Common features locally owned food vendors including a social enterprise. If you would like to walk over together meet at the hotel entrance at 6pm. Interested in the financial health of your co-operative? Dive into this full day intensive to increase your understanding of financial statements, build a financial health dashboard for your co-operative, and discuss real-world topics that worker co-operatives face. The session topics will build on financial basics covered in the CWCF financial basics webinar. To include a presentation from The Co-operators. Solidarity Happy Hour, location Carbone Coal Fired Pizza at 260 St. Mary Avenue / Alternative vegetarian/vegan Affinity Vegetarian Garden (opens at 5pm) at 100-208 Edmonton St.
Molly McCracken, Director, Canadian Centre for Policy Alternatives – Manitoba Office. 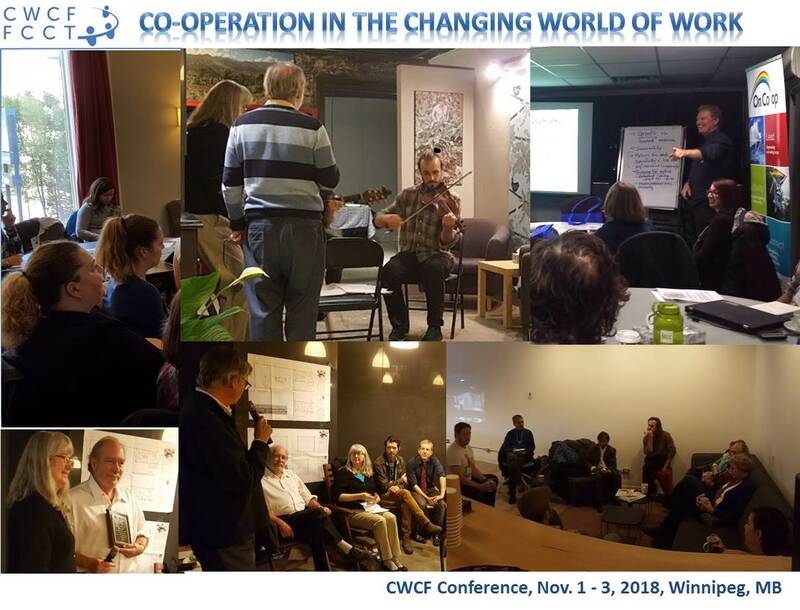 Facilitated by Carinna Rosales, Co-Director, SEED Winnipeg Inc.
To focus on how the world of work is changing which could provide opportunities for the Worker Co-op movement. Noting changes such as increasing income inequality, automation and climate change, the theme seeks to explore the role of co-operatives in providing work in the context of these extreme forms of disruption. 9:00 to 10:10 am Welcome, from CWCF (Reba Plummer), CoopZone (Pascal Billard), and Winnipeg Welcome from Jean-Michel Beaudry Director of Community Economic Development, CDEM- Economic Development Council for Manitoba Bilingual Municipalities. Peer Coaching Groups using a highly focused process among 4-6 people who use coaching to help each other address real, current, important problems and opportunities. Facilitated by Eric Tusz-King and Kaye Grant A2) Co-operatives in Indigenous Communities, and the services of Cooperatives First. By Trista Pewapisconias and Audra Krueger A3) Canadian Co-operative Investment Fund (CCIF) and other ways to finance your worker co-op. With Bill Dinsdale, Sr. Community Account Manager at Assiniboine Credit Union, Christina Baker, Director of Community Lending for New Market Funds speaking about the CCIF and Marty Frost with Human Ventures: Cooperative and Community-Based Business Development. CWCF AGM Part 2: Financial Statements and Budget B2) Social Enterprise workshop, including collaboration / overlap with co-ops with Marty Donkervoort, Social Entrepreneur and University Instructor, Sarah Leeson-Klym, Manitoba Regional Director, CCEDNet and Carinna Rosales, Co-Director, SEED Winnipeg Inc.
6:15-10:30 pm Mix and Mingle Networking Party hosted by Winnipeg Worker Co-ops, off-site at XCues Café and Lounge at 551 Sargent Avenue (transportation options will be provided). Games and entertainment include: pool, shuffleboard, foosball, ping pong and possibly video/board game options. There will be a button-making activity as well. Note that there will be transportation provide between Humphrey Inn and Suites and XCues Café. This will be by passenger van. Details will be provided on-site.